BBC Books has been publishing a line of Doctor Who related books to correspond with the show. They are original adventures with the Ninth, Tenth and Eleventh Doctors and all of their companions. I've only read a few starring the Ninth Doctor and they are pretty good even though they are going more towards a young adult audience. This one features the Tenth Doctor (David Tennant) and he's without a companion. This is during that gap between Seasons Four and Five when he's jumping around without an official companion. 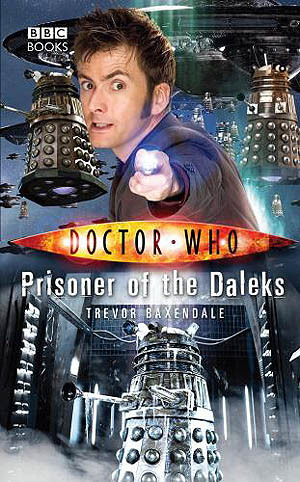 In this book he encounters the Daleks....and they have prisoners. Okay I don't know what this is about because I haven't read it yet, but the reviews on Amazon were very positive. This book is available at Amazon and Barnes and Noble and plenty of other booksellers. The used prices are very cheap. Also if you go into any Half Price Books, you can find dozens of these BBC Books. What did you think of this? Did it capture the Tenth Doctor's voice? Were the Daleks a formidable opponent? Was it better than Daleks in Manhattan? It's gotta be, right?